​Check back soon for more material. Guiding children before the Eucharistic Presence of our Lord with Guided Children's Adoration nurtures the children's friendship with Jesus and teaches them how to spend their time with Him. Guided Children's Adoration also prepares children for what they can do when they attend a “regular” time of quiet Eucharistic Adoration. It is good for children to experience quiet Eucharistic Adoration visits outside of Guided Hours. How wonderful for our children to be able to be in the same room as our Lord, their greatest friend - sitting and praying with Him, loving Him, and feeling Him love them! What a wonderful life long Divine friendship to develop! A friendship our children can turn to no matter what. A place of love and mercy where children can can always meet with Jesus. An hour is an excellent point to reach for, but a shorter time is okay too. Just like you would rather spend five, ten, fifteen, thirty minutes with a good friend even if you can’t have a full hour. Jesus, your Divine Friend, would love to have you and your children come visit Him for a shorter visit as well. 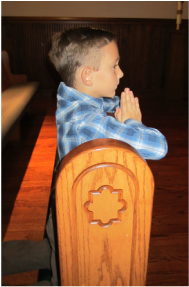 Below, you will find downloadable materials to assist children in "regular" quiet times of Eucharistic Adoration - to spend time as Just Jesus and Me. ​My Time with Jesus is a quiet self guided time for a child going to Adoration. It helps walk the child through greeting Jesus, praising Jesus, telling Jesus they are sorry, thanking Jesus, asking Jesus for needs, and listening to Jesus. ​This is a condensed version of the above, "My Time with Jesus." There are no spaces for writing in responses or prayers, but prompts to reflect on them. Print double sided and laminate for repeated use. Below, you will find several sets of printable Just Jesus and Me cards for children to use in quiet Adoration time. The card sets provide prayers, options, and sometimes guidance so that the children can spend as much time as their heart desires on any particular one. Each Just Jesus and Me card set grouping has four cards per page. The fronts and backs of each card set match so a group can be identified. If cards in a card set are broken into parts of a longer prayer or into instructions, the front of the cards are labeled in sequence. Print each Just Jesus and Me card set grouping double sided on card stock, laminate if desired for longevity, cut apart, punch hole in upper left corner, and place on a ring. Parental Co-Prayer with your child​ provides interaction with your child within the quiet of a "regular" Adoration time. This is a wonderful way to help younger children learn to spend time before their Divine Friend. When younger, my son liked to sit on my lap and when older tucked under my arm next to me. This allowed him to feel security and my love while experiencing Jesus' love - a beautiful combination! Using a parent’s two closed fists placed in front of the child, a child can pray 1 decade of the Divine Mercy Chaplet. The child can point to a parent’s closed finger each time he say inside his head/heart, “For the sake of His sorrowful Passion, have mercy on us and on the whole world.” The parent would then raise that finger up. (This might require some practice before entering the chapel.) This can also be done with the Rosary. My son and I used this prayer style often when he was 3 and 4 years old. Often our visits where less then ten minutes especially in the beginning. See the Prayer Webs below as an additional Parental Co-Prayer with Your Child. Prayer Webs can be used as a parental co-prayer with a child in Adoration or a child can use the prayer style on their own. 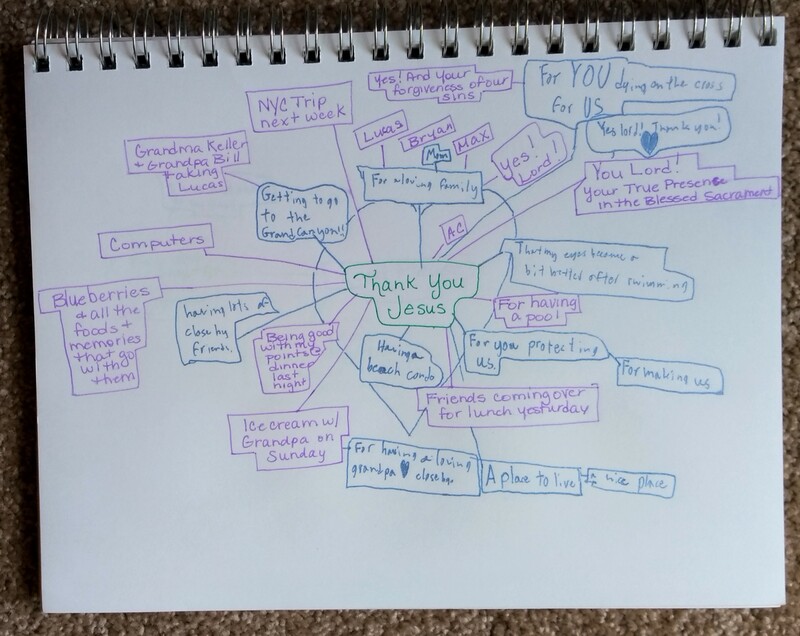 If used as a parental co-prayer, take turn with your child in different color pens writing/drawing a thanks or a petition in the format below. From my experience, ballpoint pens are quieter then markers. You can create your own on the spot with your child. An option: use a sketch book to accumulate you and your child's prayers. Or use the links below for a pre-designed prayer web.